2Do for OmniFocus Users – Sanspoint. I’m a sucker for the new hotness in task management apps. I can’t lie. I’ve bounced around between Things and OmniFocus, but dallied with Todoist, Wunderlist, and a whole host of various other apps to try to keep my life—or at least my to-do list—in sync. Right now, the new hotness is 2Do. It’s not a new app, but Federico Vitcci of MacStories gave it new exposure with his glowing, detailed review. As I’ve spent way more money on task management software than I would like to admit, I resisted giving 2Do a try. However, the recent Email to 2Do add-on got my attention. It seemed a great way to bridge an annoying gap between the way I manage tasks for my day job, and the way I manage tasks for the rest of my life. So, I jumped in with both feet, switching from OmniFocus… and then becoming remarkably confused. Try as I might, I couldn’t find any guides specifically for going from OmniFocus to 2Do. The two apps are similar in terms of features, but almost polar opposites in organization. OmniFocus is strict in its GTD  approach, while 2Do is more flexible. Which of these you prefer comes down to personal preference. There have been times when I found OmniFocus too restrictive, and times I’ve found 2Do not restrictive enough in my short time with it. Still, for anyone else in the same boat, I offer you my brief guide to moving from OmniFocus to 2Do. 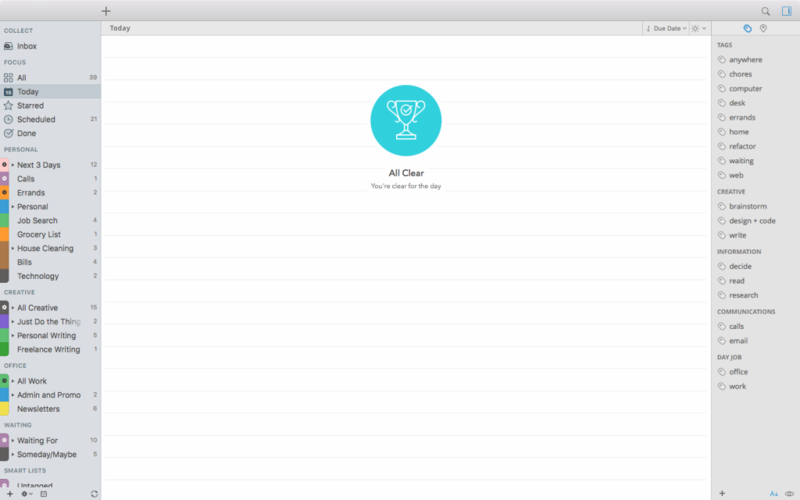 In 2Do, the list reigns supreme for organizing your tasks. Whatever, generally, was a project in OmniFocus, became a list for me. That’s not to say that 2Do doesn’t have Projects as an option, but I typically use Projects to organize “Sub-Projects” under a list. And, truth be told, I rarely used Projects in OmniFocus as true GTD-style projects, more just ways to organize related tasks. 2Do has no dedicated “Contexts”, but it does have tags, which serve as a good surrogate. The main difference is that you can assign multiple tags to a task, (sub-)project, or checklist. I don’t do this, for the most part, save for my “Waiting” context. This, I use to lock off tasks and projects I can’t do yet, and that lack a hard landscape before I can do them. This works great when combined with the ability to pause certain tags in the app, hiding them from your usual list views. There’s one caveat, though—paused tags are not available on the Mac yet. A recent tweet from the 2Do Twitter account suggests one shouldn’t hold their breath for it, either. Perspectives are the Power User feature of OmniFocus. Smart Lists are the Power User feature of 2Do. You can use Smart Lists, along with 2Do’s powerful search feature, to slice and dice task lists in a number of ways. I typically use them as a replacement for Perspectives, grouping related contexts into task lists. You can also use Smart Lists to identify tasks with start or due dates in the future, with different actions associated with them, and much more. While 2Do’s search is powerful, it is also kind of fiddly and hard to use. You’ll want to keep that advanced search page open while you set up your Smart Lists. It’s one thing to put a task in your task list. It’s another to actually do it. I have a nasty habit of letting task managers turn into roach motels: tasks enter, but they never leave. With 2Do, you can add alerts to tasks to go off at arbitrary times. If something has a hard due date for Friday, but you want to be reminded about it on Wednesday, just set an alert. It’s almost like someone wedded Due to OmniFocus! Not to be confused with a similarly named OmniFocus feature, 2Do’s Focus Filter lets you slice and dice a long task list based on a number of useful criteria, and do it on the fly. Combined with Smart Lists, it lets you get a very specific view of your tasks in a way that’s a lot harder to do with OmniFocus. This is a biggie. 2Do’s repeating tasks are very powerful, second only to Things in terms of flexibility. Tasks can start, or be due, on specific days each month, like the 3rd Friday, or Last Wednesday. I wish OmniFocus had that. In OmniFocus, it’s possible to hide every action on a list, save for the specific, first “Next Action”. Similarly, if a project in OmniFocus is set to “Sequential”, subsequent actions are locked down, and can be hidden, until the next available action is checked off. For projects with huge numbers of actions, this is a godsend for not being overwhelmed. Too often in 2Do, I go to look at a project and get overwhelmed by the number of tasks. 2Do’s creator suggest using starred items for this. OmniFocus’s built-in Review feature is something I miss a lot. It’s a great way to build a habit of checking on each individual project and see its status. There’s nothing keeping you from doing it in 2Do, but it’s not something that’s baked in as a feature. While 2Do has location-based alerts, they’re not as robust as OmniFocus’s location-based contexts. 2Do’s locations are tied to a specific geographic point, while OmniFocus lets you base context locations on a search. Both approaches have their strengths, but I prefer the flexibility of being able to have multiple options for a post office or a grocery store, depending on where I am. Then again, living in a dense urban area, location-based anything tends to be a dicey proposition, with alerts firing off when I’m nowhere near the specific location. Finally, there’s places where OmniFocus and 2Do are functionally similar enough that it comes down to preference. While 2Do lacks OmniFocus’s ability to hide all but the next action in a project, being able to hide future tasks in OmniFocus and 2Do is quite easy. I swear by it, especially for my day job. Email to 2Do is a great feature, basically building an email client into 2Do that processes any email that matches certain rules into tasks. OmniFocus Mail Drop is a more hands-on feature—you need to send or forward emails to a secret email address before they get turned into tasks. The end result is essentially the same: a new task in your Inbox (or default collection list for 2Do). 2Do has the ability to add tags to captured emails, but you’ll still have to do some manual organizing no matter which app you use. Another reason I was wary of switching to 2Do is that it has neither a native sync, or an iCloud based sync. I’m currently synchronizing my various installs with Dropbox, which isn’t ideal—but only because I’m trying to use Dropbox less. (It’s a political thing.) The sync itself is fast and flawless. So is OmniSync, OmniGroup’s proprietary syncing engine for OmniFocus. I’ve never lost a task or change in either app. I hope this helps the inveterate task management app switchers out there figure out how to go from OmniFocus to 2Do. Or, if you want to go the other way, I think this guide should be just as helpful. The important thing is finding the tool, or set of tools, that work best for you. I don’t know if 2Do is that tool, but it certainly has some charms, and the more I learn how to use it, the more I can see its advantages and work around its disadvantages.